In bud this pass-along iris from my friend Cathy is a rich black. It opens to a deep purple. The week has been stormy, with heavy rains at times, and though sunshine prevailed today, Thursday’s forecast calls for more storms. The garden is in full bloom so I have been taking photographs of sodden and drenched flowers. 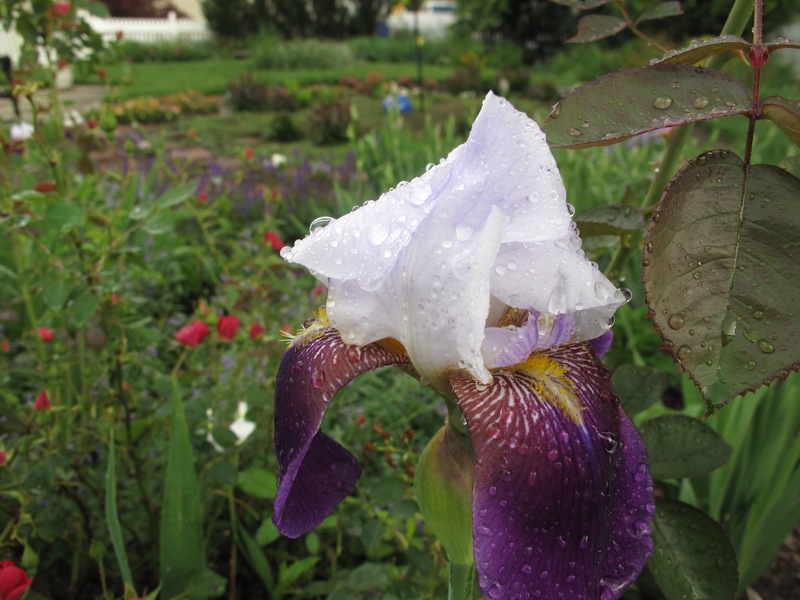 Long ago at my former home, a neighbor, Henrietta, shared many Tall Bearded Iris with me. This is one I like very much. The coloration on top of the falls where the markings are, displays a chocolate cast before blending into a lovely purple. The red flowers in the previous image actually grow on my Iceberg Rose. Did I prune it back too far at some point or is this a sport? For quite a few years there have been some red flowers, but this year I have not seen any white flowers on the bush. I created a Mesh gallery to share more garden views at this point in May. If you have time for a tour, click to start. You can make the images full-screen using the 4-corners icon. 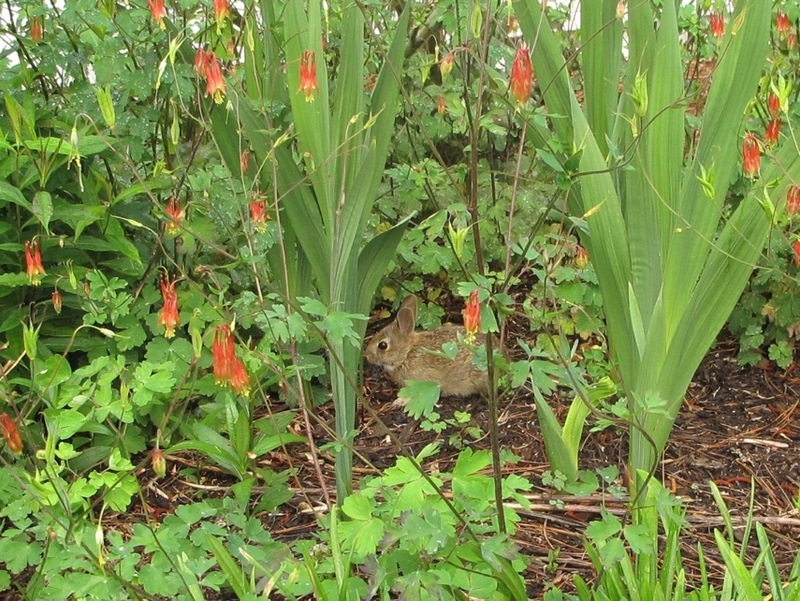 This little bunny has been eating pansies from the meditation circle and no telling what else the past two weeks. Here it is hiding among aquilegia and gladioli. What is captivating you in your early May garden? This entry was posted in garden and tagged black iris, Spring Flowers, tall bearded iris on May 4, 2016 by pbmgarden. Thank you Beth. The happiest time in my garden is now while the iris are blooming. Hope yours puts on a good show this year. Your Irises are gorgeous and the rest of the garden is looking perfect; late spring is such a wonderful time, all the foliage is full and lush and bursting with life. I think your diagnosis for the iceberg is correct, it is growing from whatever the rootstock was, but it looks a good rose anyway so I would leave it if it were mine and buy another iceberg if you want a white rose. Thanks Christina. I’ve been enjoying seeing your irises too. It’s always the best time for my garden and though we’ve had a few hot days, our spring has been cooler and slower than in recent years. Very luxurious. I appreciate the tips on the iceberg and will probably leave it for now. Of course I loved the picture of the darling bunny. Your Columbine doesn’t appear to have leaf-miners. I have the worst cases ever here in Statesville. Do you have a secret preventative? The little bunny is darling for now–he’s not very discrete. I didn’t realize you’re gardening in NC. Sorry, but don’t know a remedy for leaf miners. So far they’ve not been a problem here. I love the irises and your garden looks lush, full of colour. Beautiful place. Cheeky bunny! Thanks for touring my little garden. It’s definitely best in the spring when the irises bloom. No irises here yet, or roses, but some of my peonies have flower buds about the same stage as yours. It’s just good to see everything growing here again after such a cold Spring. Hope you enjoy a wonderful peony season. I brought some of mine in ahead of more rain and have been able to enjoy the flowers (and scent) indoors. Wonderful collection of Iris in all of their drenched beauty. Thanks, the rain continues today so I’m enjoying the irises from afar. Hi Susie, the mesh gallery is great, love the insight and tour around your garden. How do you do that? My Irises are just about to open except Mortality, that looks like its headed for the compost bin! Is your iris called Mortality or Immortality? If headed for compost guess mortality is the better name, but I can’t find a picture. Mesh is a wordpress offering for sharing a gallery (especially from a phone/tablet). I use the desktop version. Sign in with your wordpress account. Has its limitations but I had so many images and wanted to retain full image resolution, I decided Mesh might work better than the wordpress media gallery, but not sure. Let me know what you think if you give it a try. I loved the mesh gallery. Love the circle. Thanks. It will soon be time to replant the meditation circle. Thanks Judy. 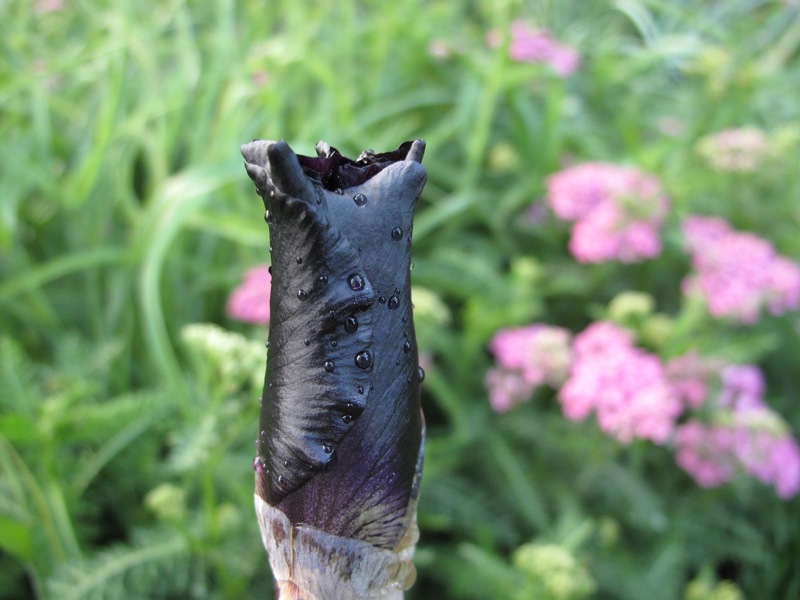 The black iris opened yesterday but it rained and rained (still is raining), so never got a photo. It definitely is inky black. I love iris season, yours are looking perfect. I think passalong is the best way to get iris, they always grow best! Thank you. Iris season is my favorite time in the garden and I feel fortunate to have so many passalongs. I am seeing some new blooms just beginning slowly….loved the rain speckled flowers! Donna, the rain has been intense this week. Hope there will be some showers left for later in the usually dry summer. Kris, some of my iris failed to bloom well. I think they need division. Neighbors report having seeing coyote here–frightening. I prefer the bunny too! Your Iris are stunning, they have such gorgeous beautiful flowers, do any of your have perfume? Your circle is also looking very good, in fact all your garden looks lovely, as always! Thank you Pauline. Happy to report that yes, many of the iris are quite fragrant. The circle needs some trimming and replanting but spring has been so cool the pansies planted last fall are thriving, so no hurry. Your bearded Iris are luscious. I also love the color of ‘Ruby Glow’. Ruby Glow is getting better and better. Really glad I found it at the garden center this spring. The second iris must be ‘Helen Collingwood’, one of the old iris that has really stood the test of time. It’s gorgeous. Can’t thank you enough for passing along the name ‘Helen Collingwood’. It certainly does match the images I found online. Thanks! Winter didn’t do much damage to your garden at all. Everything looks so beautiful and lush. I’m surprised you still have plenty of flowers with rabbits in your garden. I didn’t do much weeding and therefore there’s plenty of clover in the beds. Wondering if the rabbits enjoy that, but did observe one eating the pansies without shame.